Finding engaging toys for younger boys can be tricky due to the vast amount available, many of which will be cast aside soon after purchase. This list of gifts for 4 year old boys highlights relevant toys that are quality made and will be popular for years to come. Parker is more than just a huggable and cuddly bear. By combining with your tablet or phone, children can become Parker’s doctor and check his temperature, give him an x-ray or help cure his booboos and ouchies. 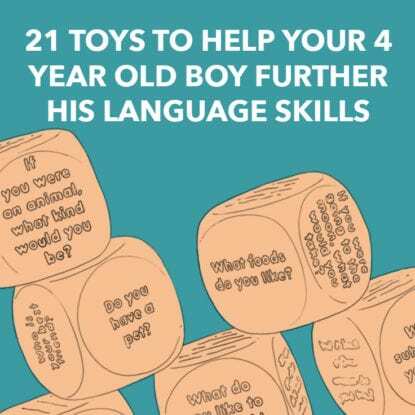 A thoughtful and instructive gift for 4 year old boys. Let your kids see how much they have grown with this fun growth chart. This delightful keepsake is personalized with your family’s name and measures growth from two to six feet. The chart is printed in Oregon with high quality inks on museum grade canvas and is designed for all the family. This personalized growth chart is printed with high quality inks on museum grade canvas and will track your little one’s growth up to 5 feet 2 inches. Featuring a navy blue sky and a range of creative constellations, this chart has your child’s name at the top and a potential further message printed on, too. All the way from Portugal, this duvet cover will turn bedtime into a Jurassic adventure for them. Designed in the Netherlands, there’s a terrifying Tyrannosaurus Rex on the front with its jaws opened wide in a permanent roar or yawn, something they’ll look for night after night. When they need a backpack to take with them to nursery or out on day trips, then this rocket bag will ensure their engagement. With two nozzles with strips of fabric fire that flap and flicker in the wind, there’s also a spacious interior and rear rocket pockets. When you start to teach your children about the world then this decorative map will enable them to understand more fully about where they live. With illustrations on vinyl free fabric and the contents packaged in eco-friendly cardboard, this map also uses residue free adhesive for its decals. This clever rocket duvet set will have your child believing he’s en-route to halfway around the galaxy. The duvet features a high quality print of a rocket that spans both the duvet and pillow cases. Set course for the bedtime stars with this quality bed set. This fun playhouse will make kids feel like they have gone to outer space right in their own home. Not only is the entire set put together in minutes, but it’s also 80% recycled and 100% recyclable and comes with wearable space gear for added fun. Collapsible for storage. This exciting duvet has a high quality print of an astronaut on both the pillowcase and duvet. Kids will love seeing themselves dressed up inside their duvet and making believe they are off to the space station or off to the stars. A unique gift that will strike to their core. These fun blocks light up and link up in a fun and colorful way that allows kids to make up endless buildings or toys. By simply adding blocks to the base, which is battery or USB powered, the set of blocks will light up in four different modes to spark their imaginations. At over 2 foot tall, the Batbot Xtreme has punching fists, projectile launchers, a motorcycle, and even a voice changer. Kids will have fun activating the built in battle mode which uses extended wings and fists. With an included Batman figure, this is a perfect gift for 4 year old boys. Get your child started on baseball with this handy and rewarding game for beginning batters. With a special hang on the wall design, the set doesn’t take up much room but will improve batting skills, motor skills and co-ordination. There’s also height adjustment to make sure the game fits your child. Prepare for battle with this handy water balloon filling device that can fill up to 35 balloons at a time on each bunch. With 3 bunches included, it is possible to fill 105 balloons in less than 60 seconds. Improve their water games with this fast filling addition to their toys. This clever set contains 3 different stunt planes that are launched into the air by stomping onto the launch pad to heights of up to 100 feet. With 3 different types of plane there’s no end to the fun your child can have, and with no batteries required it’s a healthy toy as well. These fun sets of army vehicles are made of plastic and zinc alloy, meaning they are non-toxic and odor free. Realistic in their detail, the vehicles’ joints can rotate but are also small enough for little hands to hold, making them ideal birthday gifts for a small child. What could be more fun for a 4 year old than a tractor that blows bubbles out as it travels along? Running off just 3 x AA batteries, this tractor will blow bubbles out from the bubble solution provided as well as setting off lights, sounds and other action. Paw Patrol’s Rocky sets out to clean up the streets in his recycling van with its real working wheels. There’s also a forklift at the front of the truck for heavy lifting and a rear storage area. Bring some light to Adventure Bay with this terrific toy from the popular kids series. This younger counterpart of traditional LEGO is ideal for younger children with its friendlier faces and larger bricks. Help Spiderman and the Hulk defeat the Sandman in Spider-Man’s garage and Hulk’s laboratory with the assorted accessories including a wrench, a briefcase, and a spade. Sometimes having the necessary bike helmet with you can seem a chore as you lug it about when off the bike. However, with this collapsible alternative you’ll be fresher, happier and more confident. Fully safety compliant, the helmet has ventilation channels and cute removable stickers, meaning you’ll be cool in every respect. Sail away my friends in the Shark Bite pirate ship and get set to activate “shark biting” action. Lift the hatch to reveal captured prisoners or let the canons loose on your unsuspecting enemy. Includes 2 figures, helmets, swords, a canon ball and a spyglass with which to spot treasure. This Grave Digger monster toy truck comes at 1:10 scale and has oversized mega tires for dealing with those large obstacles. There’s a working suspension and classic Grave Digger styling on the side, and this toy can transport 3 x 1:64 scale trucks and will delight as a gift for 4 year old boys. When the sun is up and kids are feeling the heat there is nothing better than a blast of cold water on the skin. This swirling water toy will let them continue their fun as they duck and dodge and is easy to fix to any standard garden hose. This terrific ride on is basically three toys in one, combining a digger, scooter and a pulling cart. There’s a music control on the steering wheel and when activated, lights will flash along with the music. Assembly is required but will take only 20 minutes for this large and versatile gift. This radio controlled emergency vehicle has a control range of 30 feet and is made from durable plastic making it crash resistant. When responding, there are lights and sirens and also a 360 degree rotating manual extendable ladder. The RC is fully functional with forward, reverse, left and right inputs. This gorgeous unicorn clock is crafted from birch plywood and has numbers, horn and a mane in fairy tale pastels. Powered by 1 x AA battery and handmade in New York, this clock makes an ideal gift for kids who have an imaginative mind and who are inspired by myths and tales. It’s time to head to the moon with this fun rocket, which features three compartments and five characters designed to current safe toy standards. The toy requires three batteries (included) and will set their imaginations free to explore the stars and space from the comfort of their own home. This fun STEM toy will stimulate their mind and increase their fine motor skills as they drill chunky, kid sized bolts into the activity board. With 120 chunky plastic bolts, a reversible power drill, screwdriver, combination wrench and 2 drill bits, this set will let your young craftsmen really get to work. Let your kids go retro with this funky set of colored pegs which combine with light to produce a funky if surreal effect. With a light behind the black board, this art tool provides a new and exciting experience to be made from the included 156 round pegs and art guide book. From the most popular building toy in the world comes this terrific fire engine that’s ready to run into danger and action. With a female and male firefighter, the engine has an extending ladder which spins 360 degrees and has a total of 214 LEGO pieces. This large toy tractor in John Deere colors has 2 speeds, including reverse, which can be locked out at 4.5 mph for beginners. There’s an accelerator pedal with automatic brakes for safety and the wheels will provide traction on grass, dirt, gravel or pavement. Complete with working FM radio. This clever little toy car has no batteries or motors but instead is powered by simply turning the steering wheel. With speeds of up to 6 mph, the car is kid friendly and suitable for ages 3 and up. In line with current safety legislation, this eco friendly car is perfect for young drivers. For the child that likes dinosaurs, this gift for 4 year old boys will be perfect. Taken from the popular Jurassic World film, the walking Indoraptor will chase after Owen in his ATV and has 2 stomping speeds, and can also open its mouth. Look out behind you with this fun toy. This fantastic silk screened, landscaped playboard allows a child to enjoy a train set at its finest. There are 3 durable red bins that slide under the table for easy storage, and a large lid to keep the toys safe on the play table. The sides also feature special T-molded edges to prevent chipping. This battery powered trike is easy to operate and gives a smooth and simple ride for a young child or toddler. There are sharp, colorful and chrome decals, car sound effects, an ability to reverse, and headlights on this fun trike that can be used indoor or outdoor as you please. This LEGO DUPLO set features a truck which has a tipping function as well as a tracked excavator with its own moving tracks. There’s also a rotating cabin and a big shovel on a poseable arm, as well as extra bricks for scooping up. A perfect fit and build for smaller hands. Because this is a classic Tonka toy, you know it’s going to be durable and robust as well as great fun to play with. This steel mighty dump truck comes free wheeling with a working dump bed and is guaranteed for life. It also has frustration free packaging so parents can remain sane too. This Megazord is easy to build and has iconic details and a chest plate cockpit within which rides the buildable Red Ranger micro action figure. There are character themed accessories with this set and the Megazord can be combined with the Sabretooth Tiger Zord and the T-Rex Zord to make a Super Megazord. This Jurassic Dinosaur world playset features pieces that can be flexed to create different track shapes. The pieces are environmentally friendly and are not harmful to kids. With 2 dinosaurs, a car, 4 trees and 142 pieces of track, this set will have them building and recreating for a long time to come. Take control of the Batcave and turn its disk to reveal a secret entrance. There’s projectiles to fire, turnstiles to rotate, and a claw to capture your baddies with. Also featuring a working telescope, a light up Bat signal, and a working elevator, this Batcave delivers fun and stimulation to any young boy. Everyone man the pumps with this LEGO DUPLO fire engine set, complete with burning flames. There’s a retractable hose and an open window to rescue people from, which means your firefighter figure is bound to be put through his paces. A total of 26 quality DUPLO pieces. This fully recyclable castle is made from 80 % recycled materials and has various dragons for your child to engage with on their quests of old. The playhouse is water resistant and can be customized with washable markers but can also be collapsed in seconds to store in your own dungeon. Tractors make great gifts for 4 year old boys, and this one is durable and tough but also made for outdoor play. With the easy to use front loader, boys can pretend to be the truck on site sorting out the mess, whilst the wheels allow for forward and backward movement. If you have a child who loves toy cars, you can hand him a roll of road to create highways for his collection. This play tape is made in the USA and third party tested to comply with today’s stringent regulations. The tape peels up as easily as it goes down onto carpet. This fun slide and bouncer has three mesh sides to protect children but also to allow adults to watch. The bouncer is held in place by the provided stakes whilst the included heavy duty blower will keep the bouncer in top condition. A repair and storage bag are also included. This fun police car is friction powered; just push it forward several times, then let it go and watch the police burn rubber. The front doors open and there are 4 sound buttons which set off a siren, a reverse car sound, a honk and an engine start. Batteries included. Watch this ball go as it defies gravity and bounces up to 100 feet in the air. The Waboba Moon ball makes a unique “pop” sound on hitting the pavement and can be taken anywhere, but its small size makes it perfect for younger kids. Change up their ball games. Made in Indiana, this set lets you create your own space rover which you can control by downloading the free app to your phone and then connecting to your bot by Bluetooth. The miniature robot can also be customized with any interlocking plastic bricks you may have around. For a child who likes to get up close and personal with the bugs of this world, this Critter Case will allow safe observation of insects. Constructed from a sturdy plastic frame with fabric mesh sides, the case’s flat base prevents it from being easily knocked over and being emptied. For a child with a fascination of cars, this hot wheels set of nine cars is perfect as gift for 4 year old boys. Ideal for starting a collection or for adding to an initiated one, these cars have eye catching detail and authentic styling, making them collectable for all ages. Your future pro NHL player will love this sports hockey set that has it all. Two easy-fold goals, 2 adjustable street-hockey sticks, 2 knee-hockey sticks, and balls make it easy to start up a game with friends anytime, and the versatility of indoor/outdoor play means they will get a ton of use out of it. When your kid is bouncing off the wall, redirect her to the trampoline. This is the perfect indoor jumper to give kids healthy, active exercise when they can’t go outside. The large jumping surface and handlebar add safety and stability. Designed for kids ages 3 to 6, this is a must-have toy. Do you have a kid who loves The Incredibles 2? Then they will love recreating their favorite scenes with this Hydroliner playset for Junior Supers figurines. This massive ship shoots projectiles, has a fold-out ice slide, rotating cooler chamber, trap door, watercraft launcher, grabbing arm, and more, and comes with an Elastigirl figure. Your kid will be the coolest guy in the neighborhood when he rolls up in this Jurassic Park jeep. With classic graphics, realistic dinosaur and racing engine sounds, and two speeds, this vehicle is ready to fight. Or flee as fast as possible. At 5 mph, hopefully, it can outrun a T-Rex. Is your child begging you for a puppy? Give him this adorable one that’s as much fun as a real dog but doesn’t have to be walked. “Ricky” already knows a lot of tricks – he can flip his bone, shake paws, bark a tune, and gobble up his treats! Your dinosaur-obsessed kid will feel like he is actually in the movie with this amazing RC “gyrosphere.” The easy-to-use remote allows the iconic sphere to roll in all directions so that your little adventurer can escape from the stampeding T-Rex. It holds two 3.75” figures, sold separately. This is the perfect first-trampoline for children 3+. With a weight limit of 66 pounds, this jumper is designed for one young child at a time. The padded frame and protective netting keeps kids safe while they are having fun, and it’s also lightweight so it is easy to move and collapsible for easy storage. This cool little toy turns an unused cell phone, leftover from a recent upgrade, into an old-fashioned camera perfect for young kids, as the molded plastic case that holds the smartphone is designed to look like a vintage film camera. Your little photog will love using apps to create filters for his masterpieces. Fans of Paw Patrol will go wild over Marshall’s fire truck playset. This super-sized toy has a ladder extension that is a whopping 2’ tall. There is a mini-firecart, lookout cab, a working claw arm, and working water cannons. It also comes with three “water” projectiles and the all important Marshall figurine. You didn’t know Thomas the Tank could be this exciting. The turbo-engine on this jungle-themed, full-size track has two booster sections that send it speeding through falling palm trees and other obstacles. You can also literally launch the train through the air to soar through the jungle temple. Your Thomas fan will love this! You will be an intergalactic hero when you give your little Luke Skywalker an actual landspeeder of his very own. With seats for two riders, the authentic lights and sounds from the interactive dashboard transport your Jedi to a mythical land. At a whopping 5 mph, he’ll be able to easily outrun the Stormtroopers. Your Jedi can fight the Dark Side with this Millennium Falcon playset. Kids can recreate air battles with the spaceship or open to a playset of the ship’s interior. As your little one soars through the galaxy, he will have thrilling adventures with this toy, which comes with Han Solo, Chewbacca, and R2-D2 figurines. This classic Tonka Mighty Dump Truck is so well-made that it is guaranteed for life. With sturdy steel construction, this virtually indestructible vehicle is ready for all the fun your kid can dish out. The working dump bed is perfect for all those big hauling jobs. For ages 3+. This is the perfect paint set for young kids. They can daub until their heart’s content with the magic light-up brush using “paints” that only work on the wonder-sheets paper. It comes with 6 colors and 18 blank pages, with additional supplies sold separately. Encourage your little artist’s creativity with this amazing set. This ingenious bag opens to reveal a huge – 55” diameter – playmat with a street scene featuring roads, gas station, buildings, and more. When your child is done playing with his toy cars and mini-figures, you can clean up in a snap! Just close the drawstring bag – toys and all – and put away for another day. Kids love to get out under covers and are forever making dens and hideouts. Now you can help them build their own fort with this clever blog that will take you through from collecting your materials to constructing the fort, aided by helpful photographs and clear instructions. For the little workman in your home wanting to copy Dad or who likes the workmen that have been at the house, this blog will show you how to make him a work bench. By following the simple instructions and photographs, you’ll have no time wasted in making your own toy for your child. Kids love to get messy, but sometimes it can be hard to focus their ideas on what they want to do. Step forward this handy blog which will detail to you how to help your kids make mud pies for flinging around during their messy play sessions. Many children love Pokémon and now you can please them with a lamp for their room that also reminds them of their favorite character. This terrific blog will take you through step by step how to put this lamp together in an easy and structured way. For a medieval item with a difference, check out this clever blog post that will have you fabricating a material knight’s helmet in no time. With great instructions and many helpful photographs, the process is made simple and easy to follow and the finished item looks fantastic on any child. You will love monkeying around with these adorable sock monkeys. Check out this tutorial for making these cute, colorful, and classic plush playthings. The variety of sock patterns these days adds to the creative options, but be prepared to make them for all your friends too, because everyone you know will want one. Make these kid-friendly dominoes that feature shapes instead of dots. Your early and pre-reader will love matching simple images of hearts, stars, and apples. Just print the free download on sturdy paper and you have a quick game to play anytime. Laminate the cards for longer-lasting game pieces. It is an undeniable fact of life that kids love slime. And it is possible that glow-in-the-dark, neon-green slime is their favorite. Fun to make and play with, this recipe is great for a party activity or take-home favor – this blog even offers free downloadable labels for individual jars. Every handyman needs a good tool belt to get the job done. Check out this cute tutorial for how to make a simple one for your little guy. Perfectly sized for Little Tikes, or other play tools, now he will have everything he needs to build projects and fix things around the house. If you have never etched glassware, you will be amazed at what you can create. This step-by-step tutorial shows you how to use etching cream and cool templates to make custom superhero glasses, but the sky’s the limit on what you can create. This makes a cool birthday party craft and take-home favor, too.